... beats the sync speed! Not bad for a 38717 sync speed! lol that's nothing it told one of my friends on a 8 meg ADSL connection he was on 74meg lol he was roling round laughing for hours and wishing it was true lol . They have just lost all my past results again. Has your IP changed, or has your browser has a moment. If you don't login it is based on cookie. If your browser looses the cookie, most associations disappear too. If you've created an account, it should never loose them. Have you emailed Ookla? I have a fixed IP address. No I was not logged in, I will have to start doing that. I do not remember deleting my cookies, but may have done. Or perhaps some of the massive updates my computer has been getting in the last few days did something. I have emailed them in hope, but it does not matter too much. That's an awful upload rate. No, it is all the CEO will allow me! It is a 40 Down 2 Up connection. Given the speedtest.net methodology, (in a simplistic view) removing the extreme samples and some averaging, I wonder what the peak speed was? 38717 is the IP Profile . As a side issue, out of interest and doesn't explain the speed test result, I believe the top OR sync on VDSL2 is around 41000-42000. 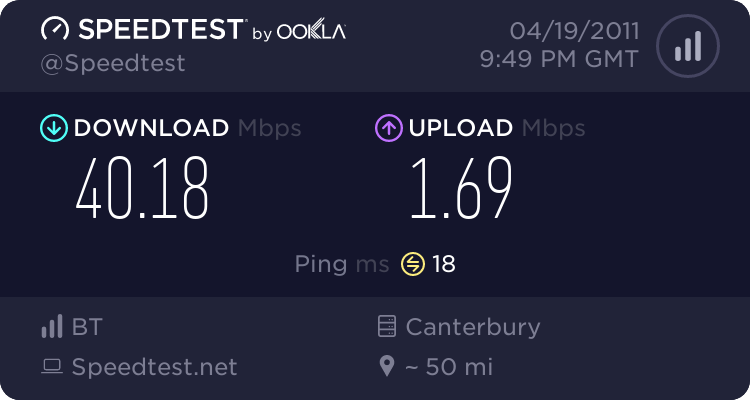 The reported (capped) 40000 is a data rate not a connection speed. Similar to the old days when a 512kbps line sync'ed at 576kbps, 1Mbps at 1152 and 2Mbps at 2272.